Netaji Subash Chandra Bose International Airport is served, currently, by one rail line. 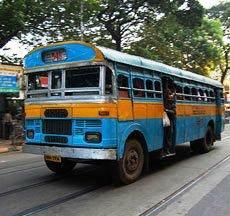 Inaugurated on 16 August 1984, the Kolkata Circular Railway is a branch of the Kolkata Suburban Railway. A single track circles the entire city as it starts from Dum Dum in North Kolkata, runs along the Ganges, runs through South Kolkata and Eastern Kolkata, and ends at Dum Dum. Recently, a new line was opened from Dum Dum to Kolkata Airport to improve connectivity. The last station, Biman Bandar (Airport) Station, lies within walking distance of the Integrated Terminal at the airport. From there, the train runs on an elevated stretch over Jessore Road and past the Jessore Road Station and then it descends to street level. The next station is Dum Dum Cantonment from where one can access multiple suburban trains to the northern suburbs and Sealdah Station in the heart of the city. Finally, the train reaches Dum Dum Junction. Here one is provided with many options. Visitors can continue on the Circular Railway to travel to neighbourhoods such as: Chitpur, Shovabazar, Burrabazar, B.B.D. Bagh, Khidirpur, etc. Passengers can also take a national rail line to cities like Delhi, Amritsar, etc. People can change to the suburban railway and travel North or South. The last option for a passenger is to transfer to the Kolkata Metro (the most efficient mode of transportation in the city) to Central Kolkata and South Kolkata. * Information related to the Kolkata Metro and Suburban Railway is listed under "About Kolkata" in "Getting Around". Currently, three different organizations have counters or an option for Airport pickups and drop offs in the city. These include the Bengal Taxi Association which runs the city's iconic Ambassador taxis. The BTA have a pre-paid taxi counter at the terminals and have a strong presence in the city. Another private AC radio taxi fleet called "Kolkata Cabs'. They have arranged for Airport pickups and drop offs. A separate organization has started, as of last year, a pre - paid taxi counter at the airport. The fleet of AC radio taxis are called "Mega Cabs" and the company has a growing presence in multiple cities across India. Auto - Rickshaws are vehicles with three wheels that can be found in almost any large Indian city. They can easily slip through heavy traffic and are cheap and fast. One can find auto-rickshaws right outside the terminals. *More information on Kolkata taxis is provided under " About Kolkata" and on "Getting Around".